If you would like to make a donation to our organization feel free to print the donation form and mail it in, or use your credit card via PayPal. You can specify where you would like your gift to go; Sammy’s Fund or Comfort Pets general fund. Just write it on your check or fill out the notation area provided on PayPal. We will gladly apply your donation as you wish. If you don’t specify, we will apply it as needed. The members of Comfort Pets appreciate your generosity. 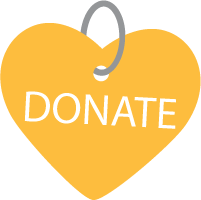 Please consider becoming a sustainable donor with an automatic monthly contribution. Click the Donate button now!